As a teacher wouldn’t it be handy to be in more than one place at a time? I’d like to give you some ways of recording yourself and getting that audio or video online. Once online, it’s a matter of copying and pasting to generate a QR code. 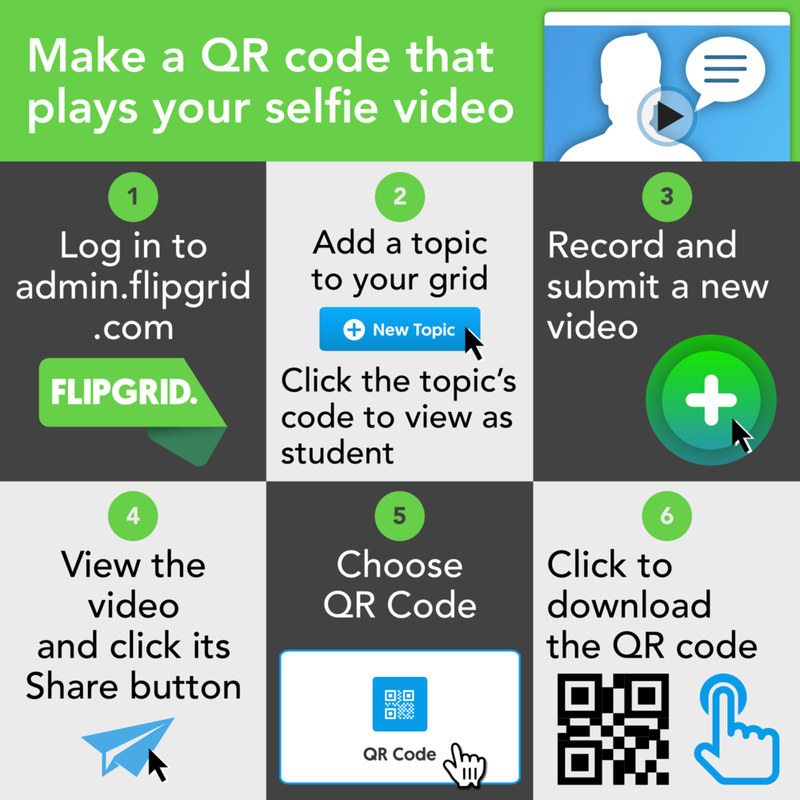 A QR code is a quick way to get students to online content. Easily providing recordings to your students means you can reteach concepts, differentiate instruction, give directions at centers, communicate with parents, and be heard and/or seen any time and any place. I've put myself into the QR code below. Well, it's actually a recording of a Periscope broadcast I did about QR codes. You don't see many QR codes online, and that's because once you're online, you can just click a link. But I included the on above as an example. 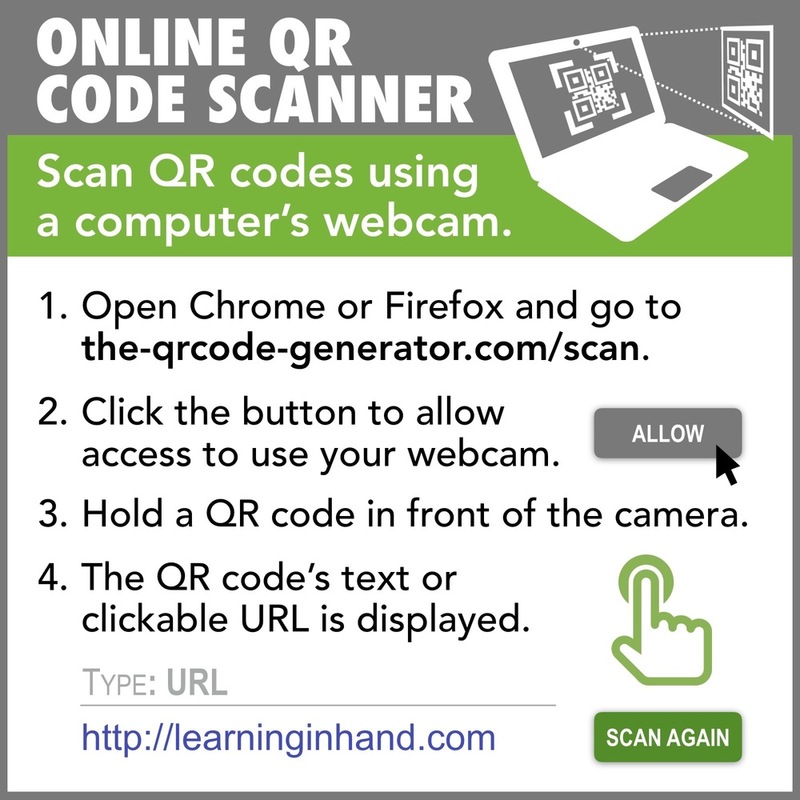 In a classroom, the QR code would likely be printed out, included on a worksheet, put on a task card, placed on a sticker, etc. There are lots of combinations of tools to get what you say and/or do published as a QR code. Let’s start with the easiest way. Vocaroo provides a simple Record button to record audio in your web browser. Recording uses Flash, so you’ll need to record on Windows, Mac, or Chrome. Don’t worry: saved recordings can be played back on any device. There is no time limit on recording. But the longer you record, the higher the chances something will go wrong with the recording or saving. The best part about Vocaroo is that after saving your recording, you are immediately provided a URL for your recording for instant access online. 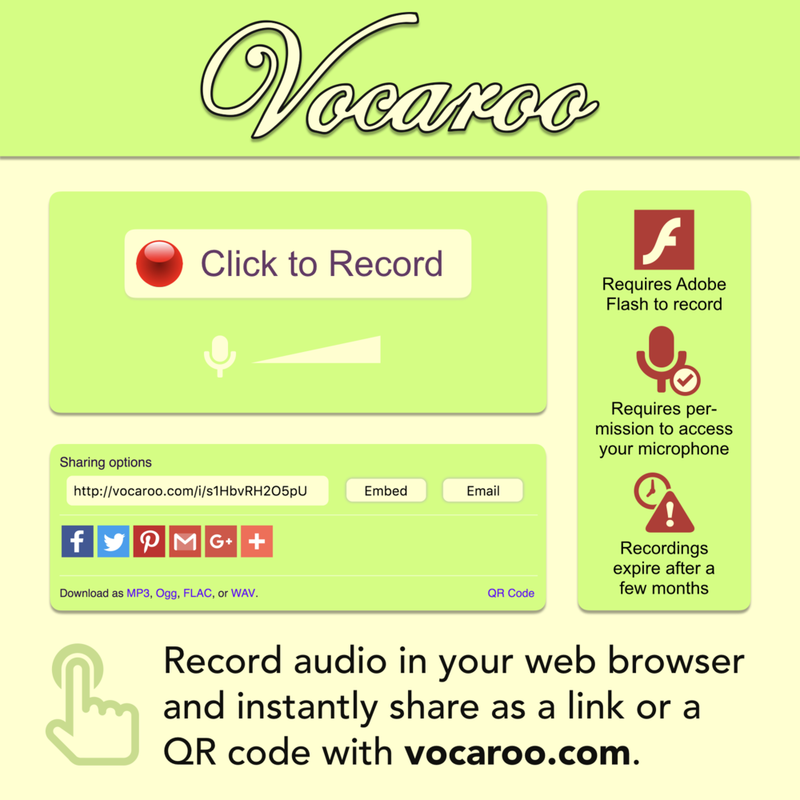 Not only does Vocaroo give you a URL, it also provides the QR code for your recording. Does Vocaroo sound too good to be true? Well, maybe it is. Vocaroo does not permanently store your recordings. They disappear after a few months. So if you’re planning to use the QR code next semester or next school year, Vocaroo is not the tool for you. These options record audio only. Most do not have time limits, but if your recording is longer than 4 minutes, consider breaking it up into multiple recordings. Very simple voice recording inside your web browser. You can trim the start and end of your recording. It uses Flash, so you can't record on tablets and smartphones. Simple audio recording app for iPad, iPhone, and iPod touch. You can trim the beginning and ending of your recording. It can share to other apps, like Google Drive. GarageBand has multitrack recording. You can trim and split clips to cut out mistakes. You can also apply audio effects and import musical clips and other sounds. GarageBand is only for iOS and Mac. If you don’t already own it, it will cost you about $5. Hint: Turn off the metronome before you record audio and click the + in the timeline to change the Section Length to Automatic. When finished, GarageBand can share to other apps, like Google Drive. Soundation Studio is web-based and works on Windows, Chrome and Macintosh computers. It’s much like GarageBand; it has multitrack recording and the ability to import musical loops. You can save as a .wav file to your desktop. You can use Soundation Studio without having to log in. This Flash-based web app simply records the audio and video from your computer’s webcam and saves it to your hard drive. There are no editing functions, which is one of the reasons it’s so simple. Since it uses Flash, WebCamera.io won’t record on smartphones and tablets. That’s no problem at all, because those devices have their own apps for recording video. Use you tablet or smartphone’s Camera app to record what you write, draw, or do. 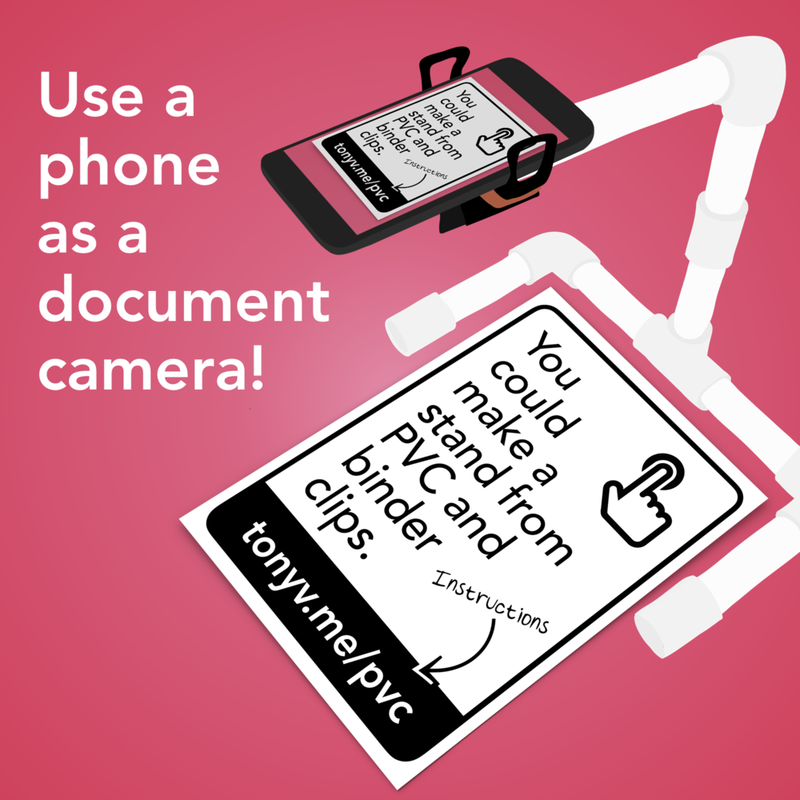 A good way to accomplish this is to prop your device up so you can use it as a document camera. You can fashion your own or buy one. My personal favorite is the Justand v2. Chatterpix for iOS provides a fun way to record your voice. Import a photo, add a mouth, and record for up to 30 seconds. Chatterpix saves to your Camera Roll. Masquerade is another fun iOS app. It lets you put on virtual masks that move with your face. You can record for up to 30 seconds and save to your Camera Roll. Import a series of photos into Shadow Puppet for iOS. Then you can record a narration as you swipe through the photos. You can save to your Camera Roll or copy a link to your upload on their getpuppet.co site. Create slick narrated slideshows with the iPad app or in your computer's browser. Import your own photos or use the built-in icon and image search. You can download your video or upload to Adobe's site and get a shareable link. Explain Everything can combine images, movies, drawings, and narration into one video file. You can save that video to your Camera Roll or desktop. Explain Everything is a paid app and available for iOS, Windows, Chromebooks, and Android. Use Pixiclip on Windows, Mac, or Chromebook to record what your do on an online whiteboard. You can bring in photos and draw on them as you talk. Pixiclip saves to its website and provides you a web link. That link can then be pasted into a QR code generator. If the recording option you use saves an audio or video file, you’ll need to get that file uploaded from your Camera Roll or desktop to an online service before it can made into a QR code. 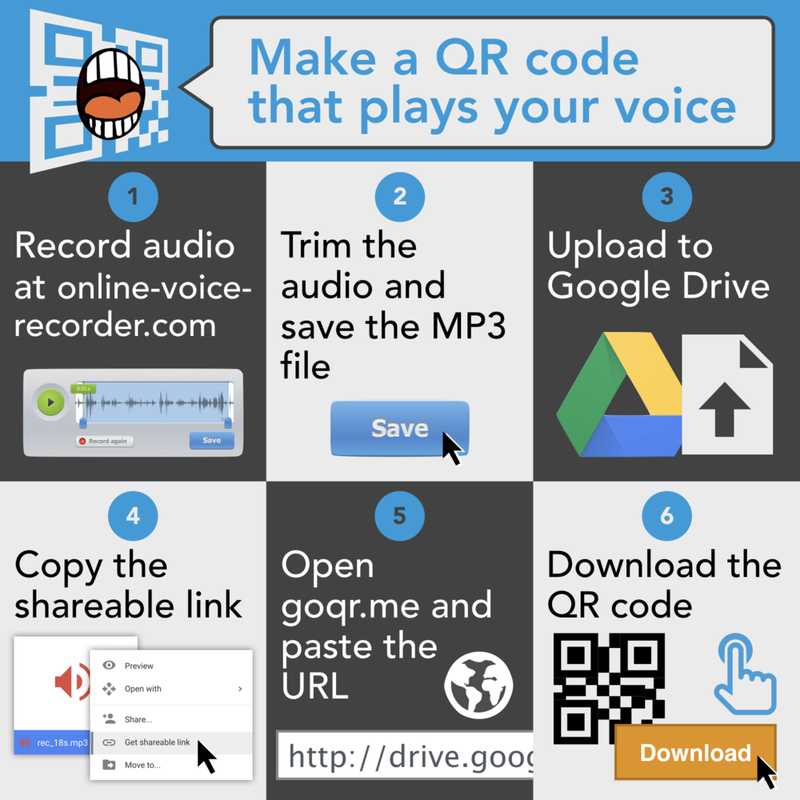 If the recording option generates its own link, you won't need to upload (copy the link and paste into a QR code generator). Upload to your Google Drive. Select the file and choose to get the shareable link. By the way, in the Google Drive mobile app, you can click the plus button and choose to record directly into the app. Also worth noting: if your account is Google Apps for Education, you will probably have to adjust the file’s sharing setting to be allowed outside of your domain. Otherwise, students will be forced to log in before viewing your video. You can upload videos to YouTube and get a shareable link. YouTube places ads, related videos, and comments next to your video, so it might not be your ideal choice. You could use watchkin.com, quietube,com or SafeShare.tv to create a link that cuts out YouTube's comments and ads. YouTube blocked at school? Maybe you can use Vimeo. SafeShare.tv works with Vimeo videos to remove comments. Prefer Dropbox over Google Drive? You can upload videos to Dropbox and copy a public link. Prefer Microsoft OneDrive over Google Drive? You can upload video to OneDrive and copy a public link. If you’re using the Education or Enterprise edition, the public link might not be so public and require a login. Got the public link copied? 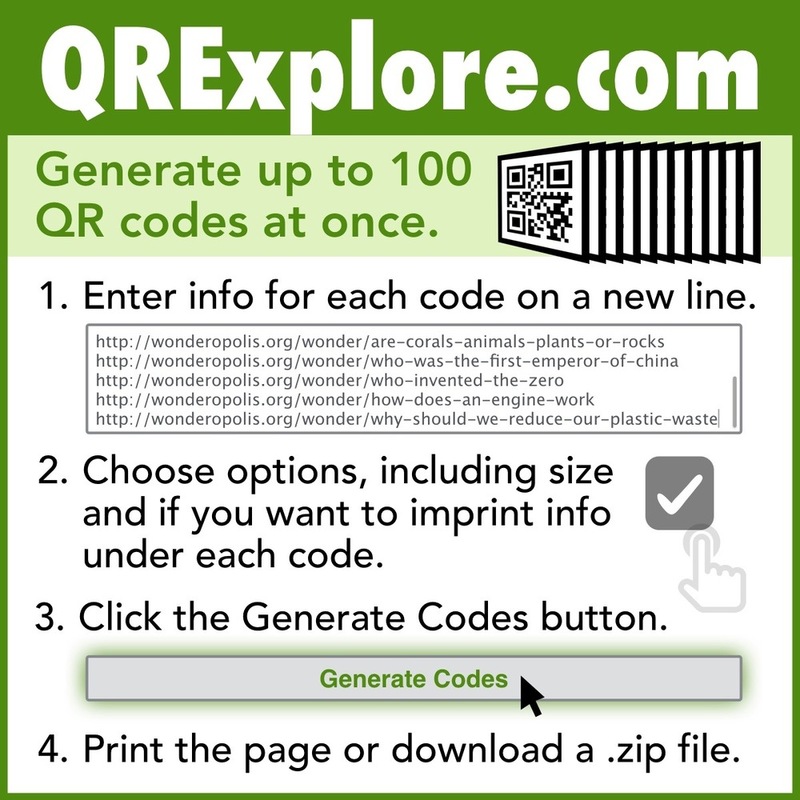 Paste into your favorite QR code generator. Mine is GoQR.me. You can save the image and print it, put it in a document, paste into your newsletter, task card, etc. I like to print my QR codes onto sticker labels. 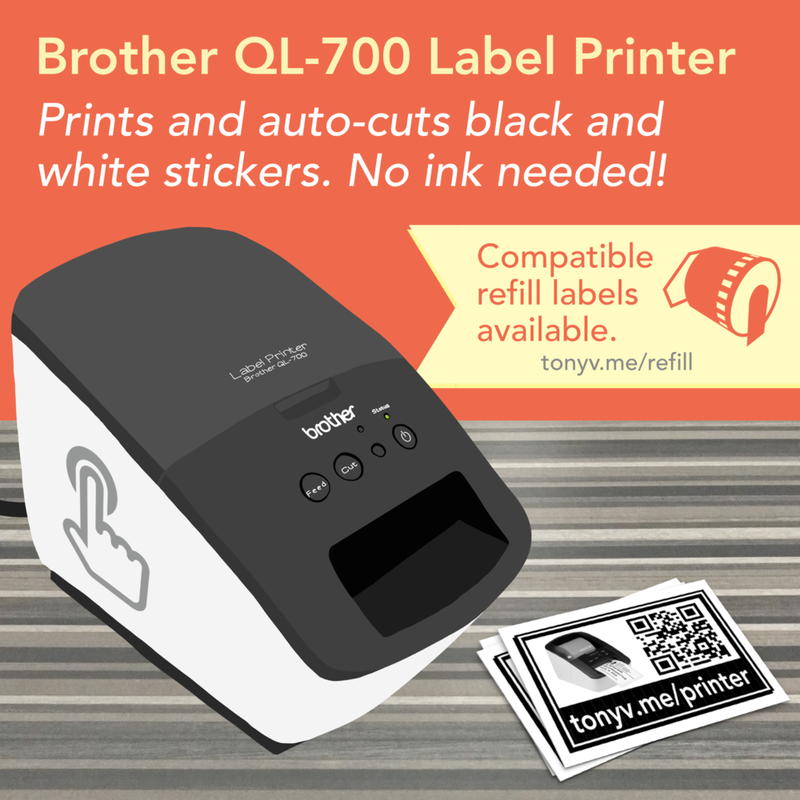 The USB label printer I use is the Brother QL-700. It cuts the stickers for me. I never buy ink since it is a thermal printer. I am limited to black, white, and gray, but that’s just fine for my QR code stickers. Brother’s 2.4 inch replacement labels are affordable. At the size I print, it costs me less than 2¢ per sticker. Test your QR code to be sure it works. 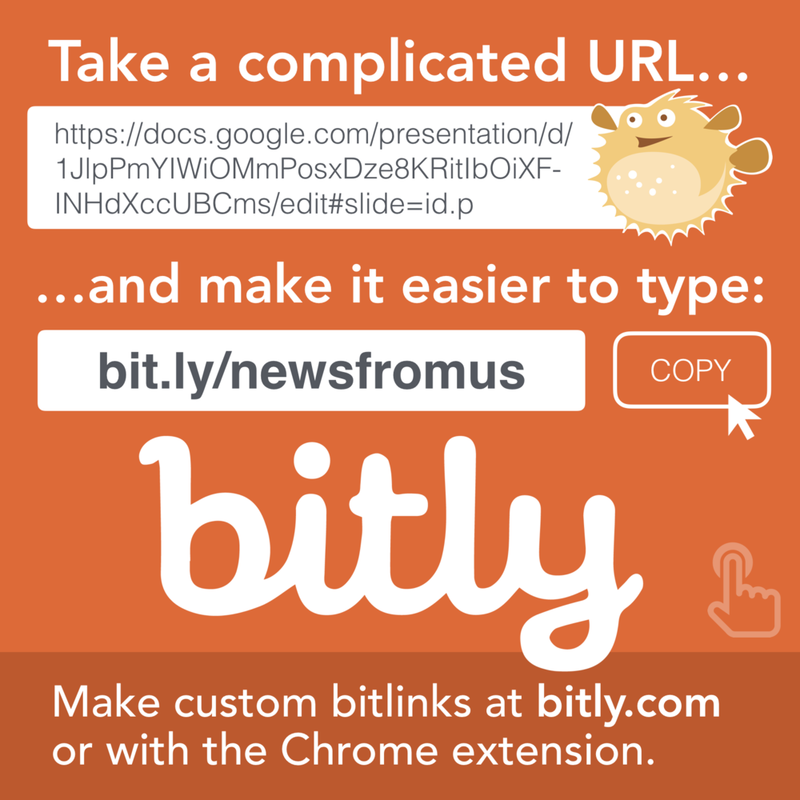 You might have forgotten to make the link public or forgot to include the http:// before the URL. Testing the code will let you know if you forgot something. My favorite QR code scanner is i-nigma. It's free, works on just about every smartphone and tablet, and is super fast. Best of all, it opens link in your browser. Other scanner apps will open links in their own browser and add advertisements. Read more about QR codes in my post What's Up with QR Codes and watch my video Introduction to QR Codes. Scan the QR codes below (or click them to follow the URL they open). The first one displays a randomly selected reflection question. The second displays a randomly selected compliment. You can make your own QR code that displays a randomly selected message. Read how in my post. I provide HTML code that you can modify to contain your own messages.